Try Shakeology risk free by ordering your free sample today! I would love to allow any of my blog readers the opportunity to try out Shakeology on me! Please know that I purchase the Shakeology samples that I am offering to you and would ask that you respect this with only serious inquiries (one sample per customer please). 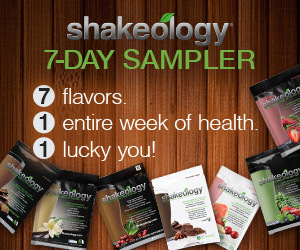 If you’d like to try more than one flavor you can get a Taster sampler pack OR I have 7 day Shakeology Starter packs available for $40 (includes a meal plan, shaker cup, Shakeology recipes and additional information. Message me for ordering instructions on the Starter Packs. Note: If you are already working with a coach, out of respect for that relationship, please ask them for a free sample. To get your free sample today please use the link below to send me a personal request. I’d like to get to know you and your needs so that I can send along some additional information as well. This entry was posted in Shakeology and tagged Meal Replacement, Nutrients, Shake, Shakeology, Spotlight, Vitamins. Bookmark the permalink.